As published here on Glamour UK. And that is precisely why I feel strongly about sharing tips – had it not been for the collective wisdom I encountered, I might still be confined to a one mile radius around my house, struggling to swallow when nervous, finding tube travel untenable. That conviction that the things we do daily have a huge effect on us is why so much of what I write is therefore not only to recommend products, treatments and practitioners that I’ve found excellent, but is also written in the hope that some of my readers might end up feeling a little better about the way they look and feel, and that this will have a ripple effect on the rest of their lives. 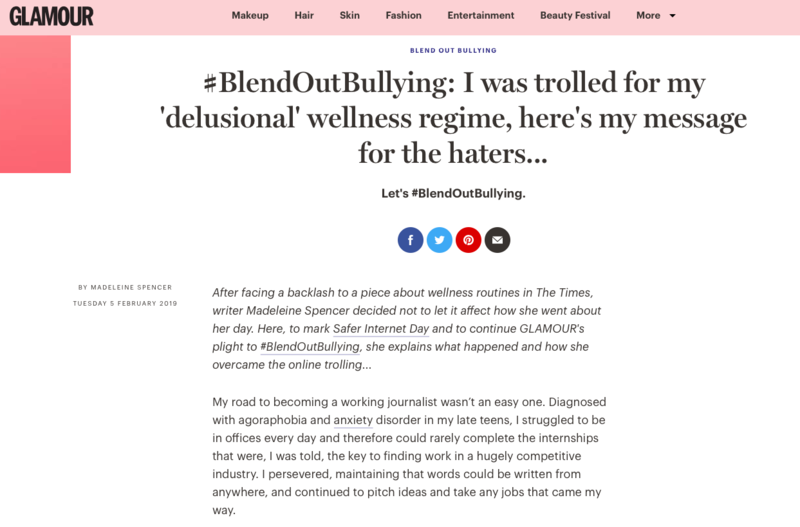 But there were also people who came out in droves to support me – and to remind me that I didn’t need to justify my routine; it was my body, my life, and I was merely laying out what I did for anyone who cared to read, and who might just as easily turn the page, ignore the piece and not take to twitter to attack those featured. My friends reminded me that I was loved irrespective of what I chose – or chose not – to include in my day and invite into my body.